Finally! A Way To Use Up Those Stupid Twisted Sisters Leftovers! In all honesty I have tried to come up with a use too and have actually taken scraps that wise students pitched in the trash can to try and figure out a use for them. The best I can come up with is arranging them in a starburst and then fusing them to a sweatshirt. My luck I’d have room for two on the front, in just the array you are imagining. I put them back in the box for another go at it later. 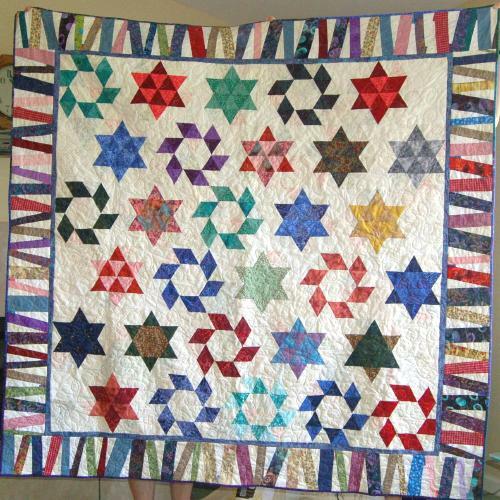 Finally, Mary Jeanine used them to border a quilt she made with one of Sharyn Craig’s patterns. She combined them with short strips of various widths and did a fabulous job. Entry filed under: Quilting. Tags: Twisted Sisters. Goshen, Indiana	I Need Help With Excel? X-cell? XL?! Gee, what’s it like to have a GENIUS as a student of yours?! Must be great. Aren’t you the one who talked about using OTF (off the floor) for borders some time ago? I think it’s a great idea to use up little cut–off pieces for a border! I couldn’t throw away my rainbow batik scraps from Ami’s workshop either! I sewed them together just like Mary Jeanine did, only they weren’t long enough, so I haven’t used them yet. 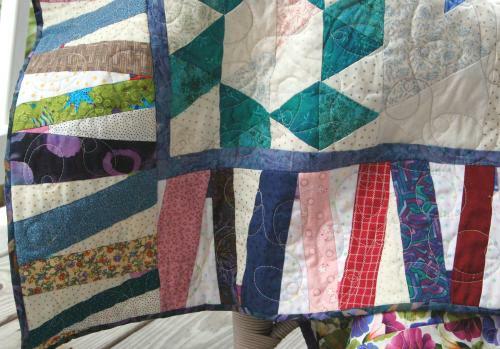 Looks like a heads-up way to use those scraps, and it does make a lovely finished border. Thanks, Ami, for sharing. What about using Cindy Walter’s Snippets ideas to create a label? Make a tree, flower arrangement, house, etc. Use stencils from office supply department of your local discount store to trace your name and/or initials and date and fill in with left over fabric. Just some ideas, no affiliation.